Does anyone in the New York area remember Black Hound Bakery? For years, there was a small shop in the mall near my house in New Jersey. Even before we moved to the suburbs from Brooklyn, we would go to this mall and stop by this bakery. I'd look at all the beautiful little cakes and chocolates on display. It was a gem of a shop and after looking around, I'd inevitably go for one of their hazelnut balls and a fizzy lemonade. I was pretty hooked on both those things. After a while, Black Hound moved from their little shop at the mall to a bigger store in the same mall. It was nice for a while...but then it closed down! I was too busy with a young child to think too much about it but I have to tell you, I could never forget those hazelnut balls, or the fizzy lemonades either for that matter. When that shop at the mall closed, there was still a Black Hound in New York City; my sister and brother-in-law were likewise fans of the bakery and their hazelnut balls, and I knew my brother-in-law visited the shop sometimes to bring treats home. But sadly, it looks like Black Hound is gone now, closing its NYC bakery about a year ago. It all started when I made that pistachio-orange-chocolate cake recently. 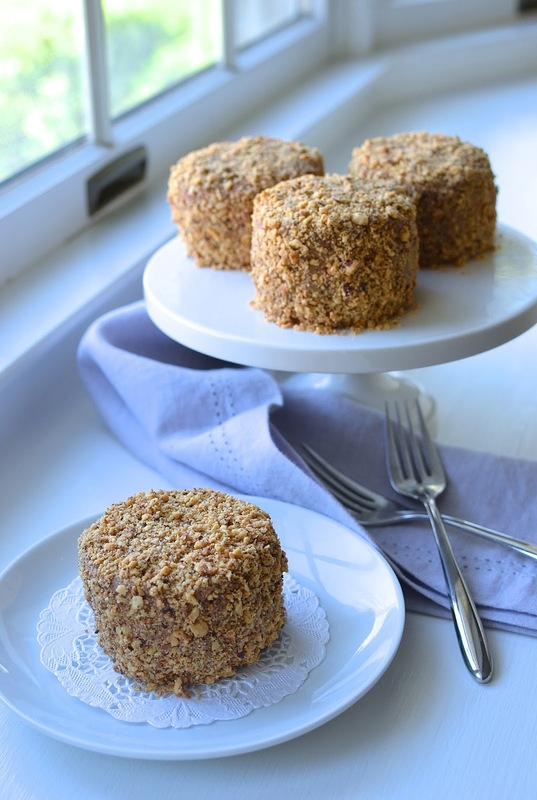 It turned out so delicious and I kept saying to myself (as well as to my husband, and anybody else willing to listen...) that its texture - a sponge cake packed with nuts - reminded me of Black Hound's hazelnut balls. I thought I could substitute the pistachios with hazelnuts and play around with it a bit. So that's just what I did! I used that pistachio cake recipe and turned it into a hazelnut cake. To mimic the snowball size of the cakes, I baked them in small paper muffin molds (I ordered these via amazon). I was so sure that the cakes were filled and coated with coffee buttercream but looking at images online, I read that it was actually a mocha buttercream! So I added a little cocoa powder to a coffee buttercream. A small amount of Dutch-processed cocoa turned my buttercream a darker color than the original, which was more beige/light-coffee colored. 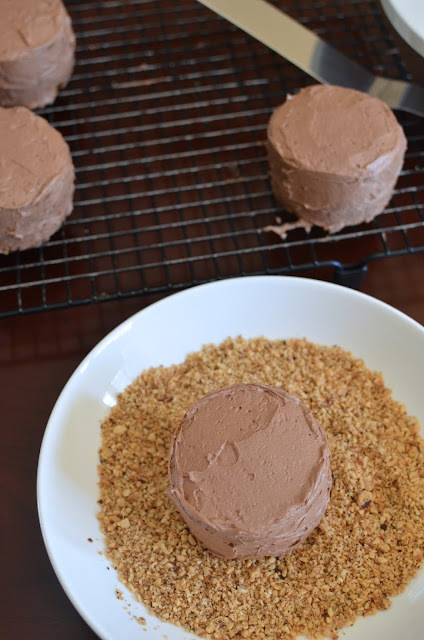 Slathered with plenty of toasted ground hazelnuts, it is all about the hazelnut flavor but you can taste the note of coffee in the background from the frosting. My taste-testers - hazelnut ball "experts" including my husband, my sister, my brother-in-law - and I were so happy to relive our Black Hound days. I got thumbs-up by all (even the little guy, who is coming around again to nuts) and was even told by my very biased crew that they preferred my version because the buttercream was "less buttery". That may be a questionable compliment, I know, but what they meant was the home version had a balanced amount of buttercream, not too much. If I had to guess, I'd think Black Hound used a swiss meringue buttercream, making it creamier than the simple American one I used. I'm sure many people would prefer more buttercream and a more buttery one at that so it's all subjective. All I can say is this totally worked for us and it was so nice to relive an old favorite and a lovely taste memory. We had coffee with our hazelnut balls...all I was missing was the fizzy lemonade! For my hazelnut balls, I essentially used the pistachio cake recipe and substituted toasted hazelnuts for the pistachios. I added a touch of frangelico, or hazelnut liqueur, which can't hurt but if you don't have it, it's not necessary since these little balls are surrounded with hazelnut flavor. I omitted the grated chocolate that I used in the pistachio cake. To make them "ball" size, I used these paper muffin molds. They measure about 2.75" wide and 2" tall. They have a firm corrugated bottom and the molds sit right on the baking sheet to bake. You don't need to grease the papers and can simply rip away the paper to release the cakes once cooled (I know because I greased two just in case and couldn't tell the difference). The only downside to using these paper molds is the cost. You can certainly bake an 8 or 9-inch round cake instead of making small cake "balls". Another idea would be to use straight-sided ramekins, making sure to grease them well; it would probably be a good idea to line the bottom with a round of parchment, too. The recipe makes 8 of these hazelnut balls; for this first endeavor, I halved it and made 4 (which disappeared in a jiffy!). For the buttercream, I had been thinking coffee the whole time until I saw an old snapshot of it online and read "mocha buttercream". Since I remember that coffee flavor distinctly, I went with the coffee buttercream I had in mind and added a little cocoa powder. As I mentioned, the "real" hazelnut balls had a pale coffee color to it as opposed to the darker mocha color of mine that I got from using Dutch-processed cocoa. It's just a visual difference compared to the real deal I was emulating. And the buttercream I made has a strong coffee flavor (I used instant espresso powder) that's tempered when spread onto the hazelnut cakes and then covered in ground hazelnuts. It's quite a nice combination. I slice the cakes across the middle and spread on a layer of the buttercream. Replace the tops and slather buttercream all around. Finally, it gets a serious hazelnut coating. Pack on as much as you can. Gently press it around the sides and the top of the cakes. Using a large offset spatula to transfer the cakes around works well. These hazelnut cakes are a treat for hazelnut-lovers. There's so much hazelnut flavor and aroma. I adore the texture of the cake itself, moist but not heavy, a lovely spongy cake with tons of hazelnut flavor. Well, time has been flying! We've shed those winter blues and it's already May! It's Mother's Day this weekend! I want to wish all the fantastic moms out there a wonderful day filled with hugs, laughs, treats, and whatever makes you smile the brightest! Make cakes: Preheat oven to 350 degrees, with a rack in the middle position. Place eight 2.75 x 2-inch paper muffin molds onto a baking sheet. Place 3/4 cup hazelnuts into a food processor and pulse until finely ground (do not over-process or hazelnuts could turn into a paste). Add add flour, baking powder, and salt, pulsing briefly to combine. Combine milk, vanilla, and hazelnut extract (if using) in a measuring cup. In a stand-mixer fitted with the paddle attachment, beat butter and sugar on medium-speed until light and fluffy, about 1 1/2 - 2 minutes. Add eggs, one at a time, beating well with each addition. On low-speed, add the hazelnuts and flour mixture in 2 batches alternating with the milk mixture in between. Mix until just combined. Divide the batter among the 8 paper molds. Bake until a cake tester inserted into the center of the cakes comes out clean, about 20 minutes. Remove cakes from the oven and place on a wire rack for about 15 minutes or so to cool. Gently rip the paper away from the cakes and remove them from the molds. Set on a cooling rack to cool completely. Make mocha buttercream: In the bowl of a stand mixer fitted with the paddle attachment, beat the butter on medium speed for about a minute. Add confectioners' sugar, cooled espresso, cocoa and 1 tablespoon of milk. Beat for several minutes until smooth and creamy. If necessary, add more milk to reach a creamy consistency (or alternatively, more confectioners' sugar if necessary). Assemble hazelnut balls: Place 1 1/3 cups hazelnuts into the food processor (you can just wipe down the bowl of the food processor used earlier with a paper towel) and pulse until hazelnuts reach a medium-coarse grind. You don't want it too finely ground but no huge chunks either. Transfer hazelnuts to a large rimmed plate. 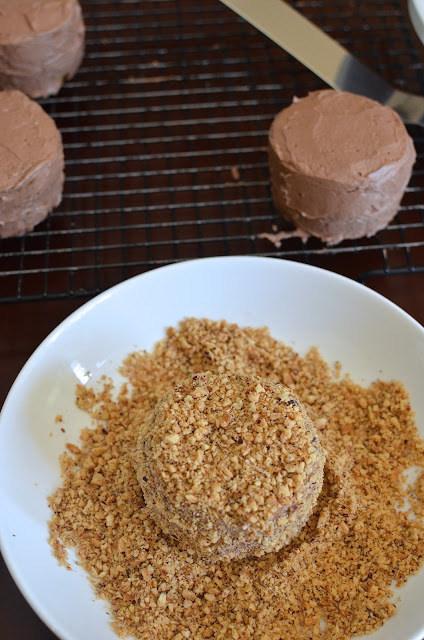 Using a serrated knife, cut hazelnut cakes in half across the middle. Spread the centers with a coating of mocha buttercream. Place the tops back on to the cakes. Spread buttercream on top and all around the cakes. Using a large offset spatula, place each cake into the plate of ground hazelnuts. Use your hands and gently press hazelnuts all over the top and sides of each cake. Use the offset spatula to lift the cake and set onto a serving dish or cake stand. Cakes can be stored in the refrigerator; bring to room temperature before serving. Now I feel kind of bummed that I never got to try this bakery...but grateful to you for recreating one of their confections so we can all try it at home!! Looks AMAZING. You're sweet...we adored that little bakery, which became a big bakery, then disappeared on us. Hazelnuts are fantastic; I'm with you! Thank you. What a fancy idea! I love just how mini and adorable they look. Bet they taste just as amazing! I love that it's maybe a little "fancy" but then so casual and just a little cake "ball" sitting on the counter. So much flavor, and great for us nut-lovers. Wow you created a beautiful, wonderful, nutty cake that is just the right size and so adorable. How cool! I have similar cupcake/cake paper cups and have been toying with mini-cheesecakes :) The cake looks moist and nutty - a perfect combination! The nuts on the outside are so unique and must be perfectly delicious! You rock Monica! Hope you have a wonderful mother's day - and a fantastic spring weekend. Tricia - you are TOO kind. Thank you so much for your kind comments. I can imagine what kind of mom you were to your kids growing up and now...super encouraging and boosting their self esteem all the time. You make me feel competent! : ) Thank you. And a very happy Mother's Day to you! Hope you are spoiled rotten! Well I'm a little sad that I will never get to try stuff from that bakery!! But I'll just have to make these cakes at home instead! You know I love hazelnuts ... and with that mocha buttercream - these little cakes sound perfect! I love desserts packed with nutty flavor and texture. This so hits the spot. Thanks, Ashley. You get what we're saying about the buttercream, Amy! haha. Maybe my palate isn't sophisticated enough but I/we just haven't gotten on the creamy buttercream bandwagon just yet. This is a nice combination though...not too much buttercream and lots of hazelnut flavor and crunch. I crazy love hazelnuts Monica - and that creamy center has my mouth watering! I've never been to that bakery, but I have to tell you - I don't think I need too, because these look amazing! Pinned! Hazelnuts are so good, Kristi! These cakes are just jam-packed with hazelnut flavor and texture. Thank you! I love some texture - and nuts - in pastries so it's right up my alley. The mocha/coffee background works nicely. Have a great Mother's Day, Christin. So true...and thank you very much, Lorraine. There's nothing better than recreating a recipe for something you can't buy anymore. Your hazelnut balls look adorable! It is a great feeling, Beth! Thanks! These look amazing, I bet they'd be great with a lemonade! I love individual desserts, this is something that I will love to have with a cup of tea! It does feel great, thank you, Monica! I love these! They're so cute and the cake sounds fabulous. 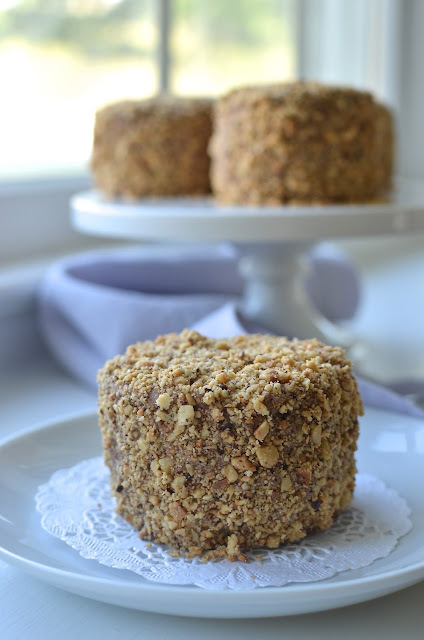 I really love the texture, flavor of this nut cake. Thanks, Dorothy. How did I miss these beauties?...don't know. These look so beautiful, moist and nutty. I love hazelnuts, actually all nuts. So glad you like it, Bal! : ) Hazelnuts has such an amazing, rich flavor...and I really love these little cake "balls". Thanks for stopping by; hope all is well!